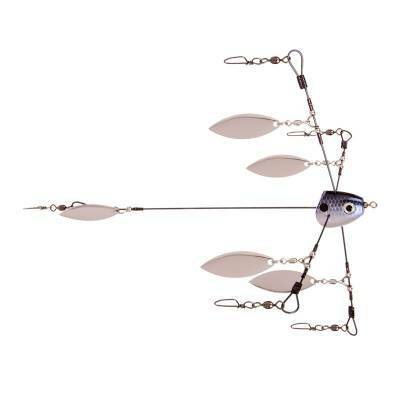 Strike King Tour Grade Bladed Titanium Wire Umbrella Rig - Blue Gizzard. Umbrella rig featuring increased flash with the addition of five willow blades. Virtually unbreakable, resilient titanium wires flex and rebound as the rig moves through the water to give an appearance of scattering and reforming schools of baitfish. Realistic painted head has a swivel to eliminate line twist.